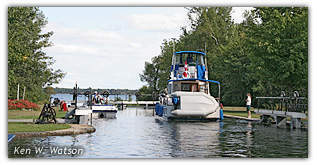 The Tay Canal is connected to the Rideau Canal by the Beveridges Locks, located at the head of Beveridge Bay in Lower Rideau Lake. This is the “second Tay Canal,” the original (first) Tay Canal followed the Tay River to its outlet into Lower Rideau Lake (see History of the Tay Canal on page 2). If you haven’t travelled the Tay, then this year will be a good year to do it. And, if you’ve travelled it before – do it again. Despite what the hydrographic chart shows (4 foot water depth), the draught on the Tay Canal is maintained by Park Canada at five feet - the same level as that in the rest of the Rideau system. As in the rest of the Rideau system, any boat with a draught of four feet or more is asked to contact the Rideau Canal Office of Parks Canada before proceeding up the Tay Canal. The limiting factor for a trip right into Perth is the fixed height of the Craig Street bridge (2.1 metres/7 feet). If your vessel is higher than this, you’ll have to dock at Last Duel Park, a short walk from downtown Perth. If your vessel is less than 2.1 metres above the waterline but higher than 1.6 metres (5.2 feet) you’ll have to have the Beckwith Street Bridge swung in order to get right into the Perth basin. Mention this to the lock staff at Beveridges who can advise when the bridge will swing. A trip up the Tay starts at Lower Beveridges Lock, a lock built in the 1880s to the same design specifications as a regular Rideau lock. A few hundred metres upstream is Upper Beveridges Lock. 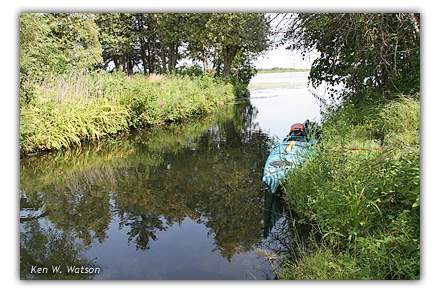 After passing through Upper Beveridges, boaters enter a dredged cut that leads to the Tay River. At the Tay, the route merges with that of the original Tay Canal. If you’re travelling in a shallow draught boat (or paddling a canoe or kayak) consider following the original route of the Tay River for the best wildlife viewing. At marker buoy NT12, turn left (southwest) to follow the meander of the river (the main channel proceeds straight via a dredge cut). The marsh lands surrounding the Tay are home to a variety of wildlife, including ospreys, herons and the reclusive Pied-billed Grebe (a small diving duck). The remains of Lock 5 of the original Tay Canal can be found at the entrance to a small side channel located just upstream of the confluence of the Tay Canal with Jebbs Creek (marker NT34). This side channel is part of the original Tay Canal. 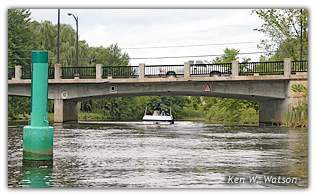 As you approach the Craig St. bridge in Perth, where you go will be determined, as previously noted, by the height of your boat. Boats higher than 2.1 metres (7 feet) will have to dock at Last Duel Park. Other boats can proceed into the Perth Basin. You can overnight at the docks at Last Duel Park for a fee. There are washrooms and shore power is available. You can also camp in Last Duel Park. The Perth Basin has lots of free docking available. If you’re travelling by canoe or kayak, you’ll be pleased to hear that, in 2008, volunteers from Friends of the Tay Watershed installed a canoe/kayak dock. This makes getting in and out of your vessel at the (very high) fixed dock in the Perth Basin much easier. Perth is a fascinating place to explore. It features many interesting shops and restaurants and makes for a great day tour or weekend outing. The story of the Tay Canal starts with the founding of Perth in 1816. After the War of 1812, the British wanted to establish settlements intensely loyal to the Crown in the interior regions of the province. A location along the Rideau would have been a logical spot, but the entire Rideau was already taken up with grants to United Empire Loyalists and no land was available. The lands around present day Port Elmsley would have been a very good spot, but the Arnold and Weatherhead families owned all the land in that area. So, somewhat by default, a location about 16 km (10 mi) upstream from the mouth of the Tay River was chosen. Originally a spot on Jebbs Creek near Otty Lake was to be the location for the new settlement, but Surveyor Reuben Sherwood ended up locating the townsite on the Pike (today’s Tay) River and Perth was born. In March 1816, a government storehouse was the first building constructed on the new townsite, to hold shipments of goods and supplies needed for the settlement. By April 1816, settlers were arriving, many disbanded members of the British military (including members of two Swiss regiments) and Scottish immigrants who had travelled to Canada in late 1815. It wasn’t long before a thriving town sprang into existence. By early 1826, the plans to build the Rideau Canal were known to the people of Perth. It was initially thought that navigation along the Tay might be part of the Rideau undertaking. But the Rideau had a very specific military purpose, Lt.-Colonel John By had no mandate to build any branch canals (there was also a proposal to run a canal up the Jock River to Richmond). When the Weatherhead family erected a mill dam across the Tay River in 1829, at the present day location of Port Elmsley, Perth business interests started to panic with the realization that they might lose the Tay as a navigable waterway. They started to float the idea of constructing a private canal linking Perth with the Rideau Canal. William Morris was the main driving force behind the idea to make the Tay navigable (he’d lobbied for this as far back as 1824). On March 16, 1831, he saw the first part of his vision come to fruition when legislation to form the Tay Navigation Company was passed. Tenders for the construction of the canal were released in June 1831 and the task of building the canal was awarded to John Jackson, an ex-Sergeant in the army and a miller in Perth. From Perth to the mouth of the Tay River, the Tay River dropped almost 28 feet (8.5 m). The actual change in elevation to be overcome would be less than this since the Rideau Canal dam at Poonamalie, when completed in late 1831, would raise the level of Lower Rideau Lake by about 4 feet (1.2 m). Going up the Tay in the pre-canal era, a traveller would first encounter Fishing Falls, as set of rapids about 2.4 km/1.5 mi in length with a vertical drop of 5.8 m/19 ft. This is the location of present day Port Elmsley. Less than a mile (1.6 km) above Fishing Falls were M’Vittie’s Rapids that extended for almost 1.6 km/1 mi with a drop of 2.1 m/7 ft. over that distance, to the foot of M’Vittie’s Still Water. At the head of M’Vittie’s Still Water, located at the confluence with Jebbs Creek, were the Upper Rapids, about a 100 m/300 ft. in length with a drop of about 0.4 m/1.5 ft. These were the main navigation impediments that had to be overcome to make the Tay navigable. The Tay, downstream of Perth and outside of the rapids, averaged about 0.9 m/3 ft. in depth. The banks were swampy and the river was choked with sedge-grass, bulrushes, and wild rice. The river near Perth flowed over flat ledges of limestone. The canal was designed with locks 90 feet long by 20 feet wide (27 x 6.1 m) and a depth in the channel of 3.5 feet (1.1 m). This would accommodate any type of Durham boat and even some small steamers. It was an economic decision not to make the locks the larger size of the Rideau locks. It was felt that this size would accommodate most of the commercial traffic of the day. Construction proceeded at a slow pace, limited by the amount of funding that could be raised each year. Originally four locks were planned, but it was soon realized that a fifth lock would be required in order to reduce the amount of flooding (which in turn would have meant compensation to the owners of the flooded land). In the end, 5 locks, 6 dams (with timber slides), two swing bridges and several embankments were built. Although the Tay Canal was opened to commercial traffic in 1834, it wasn’t yet finished. Jackson was having a major problem trying to install the lower gates of Lock 1. He apparently hadn’t fully appreciated the rise of the water caused by the Rideau Canal dam at Poonamalie, and the depth of water at the site of the lower lock hampered the installation of the gates. The gates were finally hung, with assistance provided by Rideau Canal engineers, in late 1834. Another initiative of the Tay Navigation Company was to build a new steamship for the Tay Canal. Constructed in Perth and named the Enterprise, it proved too large for the size of the Tay and never saw service on the canal (a tale reminiscent of Robert Drummond’s steamship the John By that proved to be too large for the Rideau Canal). The Tay Canal encountered problems from the beginning. The Royal Engineers described the Tay as “rough in construction and composed of not very durable materials.” The water supply of the Tay was unpredictable and the navigation channel suffered from build-ups of weeds and silt. One of the biggest problems was that many of the goods destined for Perth had to be transhipped, offloaded from Rideau barges and re-loaded onto Tay barges. The Tay Navigation Company set up a depot on Stonehouse Island (Perth Landing), which, while it bordered the Rideau Canal, was in a poor location to be properly serviced. The Tay never generated sufficient revenues to ensure proper maintenance. As the years went by, the condition of the canal deteriorated. In 1865 several of the locks were destroyed by logs and the canal was shut down. In the mid-1880s, another canal was built to connect Perth with the Rideau, the one we can travel on today, but that’s another story. Our call for volunteers for the Resources for the Rideau project in the last newsletter produced a great response from our membership. We now have several people working, or about to start working, on a variety of interesting manuscript reports. The project involves scanning a copy of the report to turn it into editable text and then, using a word processor, editing that text back into the format of the original publication. At the end of the day, FoR will take the edited work and convert it into a Book on CD. This is an “in the fullness of time” project - no deadlines - each report gets done when it gets done. We thank the volunteers that have come forward: Beth Tilbury, Bob Sears, Helen Parson and Alec and Jocelyn Rait. The work they will do on these reports will provide a wonderful Rideau legacy, allowing present and future generations to learn more of the fascinating story of the Rideau Canal. We are pleased to announce that a second Manuscript Report, No. 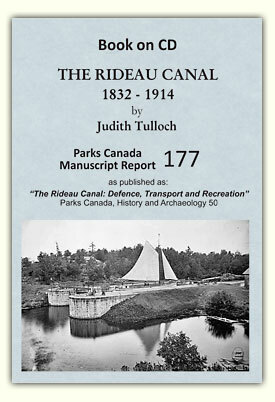 177, “The Rideau Canal, 1832-1914” by Judith Tulloch, has been completed as a “Book on CD.” You should see this available for sale on the Friends of the Rideau website sometime in late February. As the title suggests, this report is a broad sweep of the Rideau from its opening in 1832 up until the start of WWI. The version we’ve transcribed is that published as “The Rideau Canal, Defence, Transport and Recreation,” one of Parks Canada’s History and Archaeology series of publications. We’ll have more details about the book on our website once it is available for sale. We are very pleased to announce that a Friends of the Rideau business member, Long Island Marine (LIMI), has received three more environmental awards (including being a “five anchor” rated marina, having achieved the top rating in current best practices in environmental performance in all areas of facility operations and management). Congratulations to Gillian Organ for running such a clean ship. Read the news release below for more information about the awards. It’s a hat trick and we don’t see many of those in Ottawa these days. Long Island Marine and its owner, Gillian Organ, have been awarded their third business environmental award in the past year. The latest award comes from the Canadian Safe Boating Council, a national group promoting safe boating throughout the country. Ms Organ accepted the award on Jan. 11 during a dinner in Toronto. The award is given to the marina demonstrating the best environmental practices. Long Island Marine is on a part of the Rideau Canal, known as the Long Reach, located in Kars, in Ottawa. Last November, Ms Organ received an award from the Rideau, Mississippi and Nation River conservation authorities for her efforts in reducing the marina’s footprint on the environment. Before that, she was awarded a five-anchor rating from the Ontario Marine Operators’ Association after a gruelling audit of her 32-acre marina. The audit required the marina to meet more than 200 criterions for its top rating of five anchors. She was recognized for installing a water-efficient composting toilet system at the site and has plans for a waste-water garden. She has also just managed to secure a company that will recycle oil containers, which would normally have headed for the dump because the city’s contractor won’t take them, and is still challenging the city hall to make sure the plastic wrap for winterizing boats is recycled. From the time she took over the marina more than 11 years ago, it has been converted from a desolate spot to a friendly green location, its shoreline restored to the point where ducks now nest on her property, sometimes under boats that are still on the yard! Last year she banned the use of Styrofoam on her property. Instead she promotes the use of bio- degradable plates and utensils. A special composter has been built and the plates, spoons and cups will be used this spring to fertilize plants on site. A celebrity guest at the Skate-the-Lake event, held on the ice of Big Rideau Lake, on January 31, 2009 in Portland, was comedian Rick Mercer, who showed up to film a segment for his CBC television show. He participated in the relay race, with a few shenanigans along the way (such at hitching a tow from his camera crew). He also added a ringer to help out his team, Tania Vincent, Olympic champion short track speed skater.